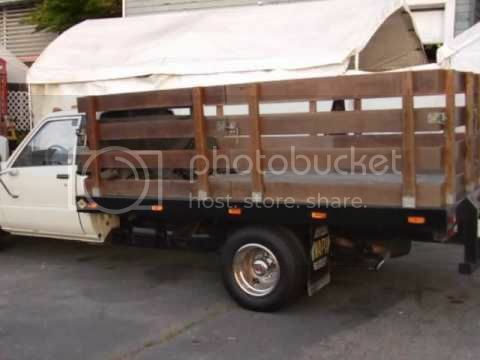 Does anyone have some designs or plans for a flatbed for the regular cab short bed? Looking to keep bed length between stock and 6 foot 10 inches. To PaineTrain04, the OP: h.stickeye's truck started life as a Long Bed, but the principle would be the same. I might stick with a wooden bed that is cased in steel. My fourwheler that I move around is about 900-1000 lbs. 2) Replaced bed with sheet of 3/4" marine plywood and stained and finished it with satin Varathane, several coats. 3) Plywood was extended three inches out on each side of the doors to increase the total bed area. 4) Installed a wood 'rail' four inches high around the base of the plywood, except for the area against the cab of the truck, which I brought up to just a few inches below the rear window. 5) Using the base rail piece on the other three sides, I installed vertical stakes four inches wide that matched the height of the board at the cab of the truck. It's easier if you install the vertical stakes BEFORE you mount the plywood to the bed. 6) Installed cross pieces on the rails and a cap piece around the top to hold everything together. The section in the back was hinged, etc so you could drop it. You must finish all these pieces so they are waterproof. The only downside is that rain will soak anything you carry in the back. Add a rubber mat to protect the wood if you want. This setup holds more cargo, and weighs less than the original steel. Expect the rear of the truck to come up about an inch. I dunno...it looked cool and seemed like a good idea back then, but that was about thirty years ago. I attached a picture below of a guy who did this to a one-ton Toyota. Now...HE used way heavier and wider wood than I did. But you get the general idea. If you go smaller scale, you can increase total bed area, and yet cut the weight on the truck. On my old Toyota, I noticed the difference in acceleration right away. If you want to cut weight even more...go with 1/2" marine ply instead of 3/4". Unless you are planning to haul scrap iron all the time, it will work just as good as the 3/4. Last edited by XoXSciFiGuy; 10-20-2018 at 02:44 AM. My heaviest thing I would be hauling around is my fourwheeler, which weighs about 800lbs I would guess. I'll be sure to incorporate removable wood sides and probably a headache rack of sorts. I noticed you had two different style flatbeds on your D21. Did you buy them pre-manufactured? So the first very plain square looking one was premanufactured and would have been put on the truck soon after it was bought. Most of these models (single cabs from 91-93) were sold bedless in Australia as most people wanted to put on cheap flat beds so they could use them for work. The second one, with all the holes and whatnot is my design custom made. But thats just the actual dropsides and headboard. The bed itself is still the original mounting and is made from aluminium. If I was to make it for myself I would probably use solid steel as it provides a better unladen weight for the rear.